It was a four-day whistle-stop tour of the top of the south. There were long-tailed bats, fantails, royal spoonbills, pukeko and a whale. It was definitely a whale, and definitely not a rock. Forest & Bird’s National Volunteer Co-ordinator Heidi Quinn had spent the last seven weeks on the road visiting almost every single Forest & Bird branch. I joined her on the final leg to talk to branches about their projects, successes and hopefully discover a few untold stories worthy of a wider audience. It wasn’t your usual sort of road trip. 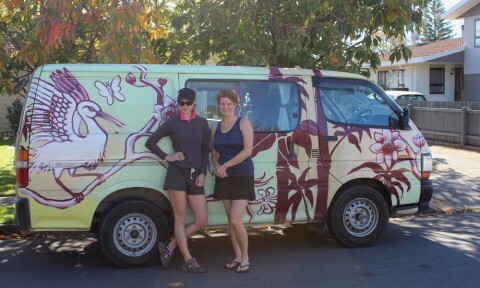 Firstly, we were driving a graffiti-covered van called Florence. (Thank you Escape Rentals). Secondly, we were met with unwavering generosity from branch committee members who gave hours of their free time to show us around local projects. Their hospitality was surpassed only by the sheer amount of their talent, knowledge and passion for conservation work. Golden Bay branch’s Jo-Anne Vaughan showed us the quirky Labyrinth Rocks near Takaka. Forest & Bird members are among the volunteers who undertake weeding at the 2ha forested maze of limestone rocks. Jo-Anne led the way among the 3km of winding trails, while Heidi and I took in the lush native bush and children’s toys hidden among the rocky crevices. Julie McClintock from the Nelson-Tasman branch was a wealth of knowledge, especially on the wonderful, and ambitious, ecological restoration work at Paremata Flats Reserve, 20km north of Nelson. She wasn’t surprised to bump into project co-ordinator Ian Price while showing us around. Ian was that day armed with weed spray. He’s at the reserve two or three days a week and it’s his dedication that’s driving the branch’s bid to propagate over 100,000 trees during the next five to seven years to regenerate the area. But it was bat spotting at Pelorus that had me wide-eyed like a kid in a candy store. Just before dusk we flicked on our bat monitors and waited. Patience not being my strong point, I was ready to call it quits after 25 minutes without a whisper of bat activity. But then the characteristic flicking noises crackled through the monitor. We cast our eyes skyward and saw one lone black circle flying under the lamplight. My first long-tailed bat. Categorised as nationally-critical, the little nocturnal fuzz-balls are also extremely hard to spot. We stuck out another 20 minutes in the cold as our radios picked up more batty activity. When they were gone we headed back to Florence, crunched the gears (sorry Escape Rentals) and continued on our way. And that whale? Sighted from the Kaikoura foreshore, and barely 100m from the main street, Heidi and I watched delighted at the black lump rolling just above the water. It didn’t wave its tail and barely broke the surface. But I was stoked. How often do you stumble across a whale in your lunch break?